SP Enanthate 10 ml vial 250 mg/ml is one of the most popular steroid that contains 250 mg/ml of testosterona enanthate. Testosterone enanthate has a pronounce anabolic and androgenic activity . It is a specific androgenic effect: it is a stimulating effect on the development and function of the external genitalia, prostate gland, seminal vesicles, including secondary sexual characteristics in men (voice, hair). He takes part in the formation of the constitution of the body and sexual behavior in men, activates libido and potency, and stimulates spermatogenesis. Reduces the production of luteotropic and follicle-stimulating hormones. SP Enanthate possesses pronounced anabolic properties, accelerates protein synthesis (provides a positive nitrogen balance), and also has a lot of other effects beneficial to the athlete. Enanthate is a long-acting ether. It should be noted that the period of exposure largely depends on the individual characteristics of a person and can vary within two to three weeks. The half-life is 6-7 days. - Increase muscle mass (The rapid increase in muscle volume is partly due to the accumulation of fluid that occurs due to the estrogenic activity of testosterone and sodium retention. After the course of Testosterone Enanthate 250 ends, the phenomenon of recoil is observed (more or less pronounced). -Elimination of joint pain, problems with intervertebral discs and a crunch in the shoulders. -Stimulation of regenerative processes in the body. 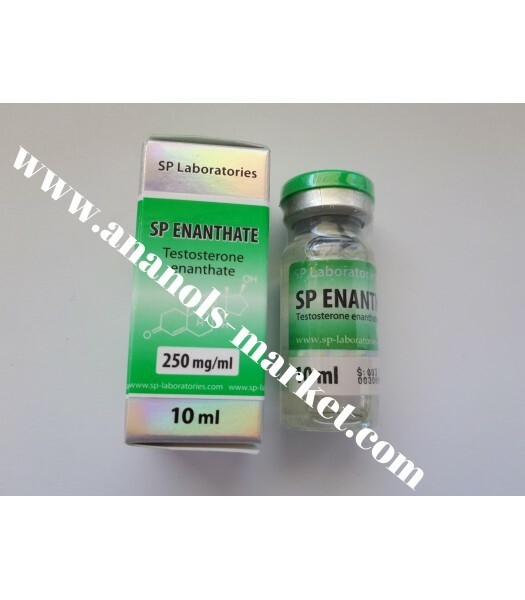 SP Enanthate is recommended for adults who have completed a full medical examination. Injections are performed no more than twice a week. Dosage is selected individually, and depends on many factors. In general, safe limits range from 250 to 500 milligrams. As body weight increases, it is possible to increase the amount of the drug administered. The average course of testosterone enanthate solo lasts approximately two, two and a half months, with PCT starting only two to three weeks after steroid withdrawal. If you are a beginner and do not know how to take testosterone enanthate, then it's best to start with 250 milligrams, and trace the body's response.